I have a friend in Brazil who tried to send herself a package with cloths, the value of which was maybe $100 dollars. The Brazilian government tried to levy a tax of $1563 reais ($350 dollars). At both the small scale, personal level, and at the macroeconomic level, I am afraid that Brazil has become a joke. Serious people, my friends from Harvard, Stanford, and Jesuit schools think that Brazil is shorthand for corruption, mismanagement, and outright stupidity, with a population so uneducated that almost every simple job requires 3 or 5 Brazilians, just to make work for the uneducated masses. Here, the President of Brazil shows where the money that the Brazilian government tries to collect is going — to pay for the primary deficit in the budget. Is it any wonder that so many Brazilians with any money are putting it in American banks, or sending their children to America or Europe for extended educations? WHEN a president has single-figure approval ratings, faces calls for her impeachment, and has lost control of her political base, is she in a position to play hardball with the country’s legislators? Brazilians will soon find out. 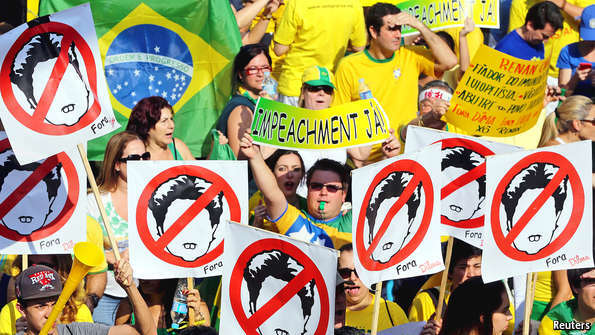 On August 31st Dilma Rousseff, their president, sent Congress a budget for 2016 with a gaping primary deficit (before interest payments) of 30.5 billion reais ($8 billion), or 0.5% of GDP, challenging its members to close the gap. 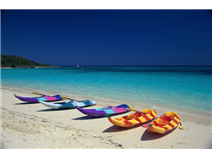 It was a break with the sound-money practices that have underpinned Brazil’s economy. It was, some critics say, illegal. Certainly nothing similar has happened since at least 2000, when Fernando Henrique Cardoso, then the president, transformed public finances. On a charitable view, Ms Rousseff was shocking legislators into making hard decisions rather than simply blocking her fiscal proposals. A harsher reading is that she does not know how to lead Brazil out of recession. The markets took that view. The day after the budget bombshell, the Ibovespa stock index fell over 2% and the currency closed at 3.7 per dollar, its lowest since December 2002. On September 2nd, the central bank held steady a key interest rate it had been raising since last year. Public finances have already deteriorated this year. Having originally planned a primary surplus of 1.1%, in July the government cut that target to just 0.15%, as interest rates rose and tax receipts fell. The total deficit this year will be 8-9% of GDP. In August Moody’s, a rating agency, cut its assessment of Brazil by a notch to just above junk status. 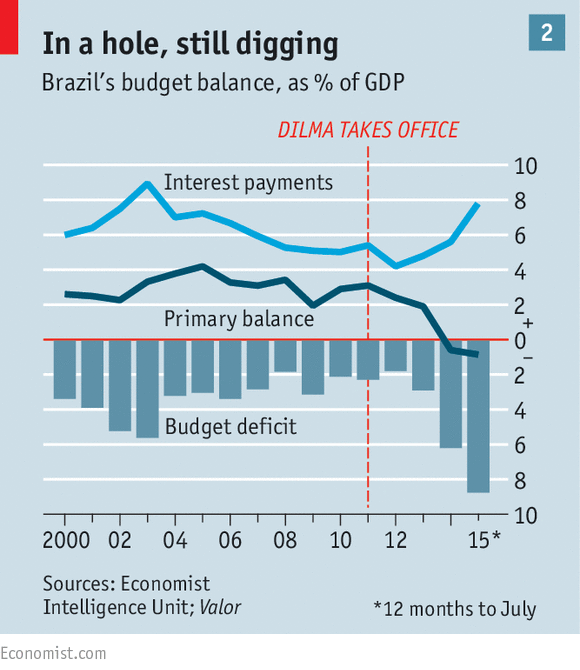 It hinted at worse to come by calling the latest news a sign of “the fiscal challenges that Brazil continues to face”. The risk of a downgrade is one reason for the pessimism which, some pundits think, is now the prevailing mood in the corridors of power. “The government is basically throwing in the towel,” says Alberto Ramos, an economist with Goldman Sachs, an investment bank. Ms Rousseff is in a tight corner. She issued her budget after scrapping a plan to reinstate a tax on financial transactions that would have brought in 80 billion reais in 2016. She retreated after her vice-president, Michel Temer, rejected the idea and told her Congress would block it. Several opposition figures say that, far from finding a way to make Congress do homework, the president has broken a fiscal-responsibility law enacted in 2000 as part of an effort to mend Brazil’s finances after decades of chaos. They say they may take her to court. On this point, the president may be right. Mansueto Almeida, an economist who is critical of Ms Rousseff, says that though the law requires the executive to show how its spending will be funded, it allows a rise in debt. Júlio Marcelo de Oliveira, a prosecutor for the Federal Court of Accounts, agreed that the president, whose alleged budgetary misdeeds he has previously investigated, acted legally this time. Legal or not, the president’s move weakens her American-trained finance minister, Joaquim Levy, who was reported to have lobbied for further spending cuts and was a reassuring figure for markets. Ms Rousseff has consistently failed to hit economic targets since being elected in 2010, but in the early days she dodged the political flak. Many people blamed her then finance minister, Guido Mantega, who was known for over-promising. Replacing him with Mr Levy was supposed to fix that problem; his loss of face bodes ill.
To restore credibility, Mr Ramos argues, the government needs to end up with a primary surplus of 3.0-3.5% of GDP. Simply stabilising the debt-to-GDP radio is not good enough, he says: it is already too high. At a minimum, tough horse-trading with Congress looms. Renan Calheiros, the president of Brazil’s Senate who has had several rows with Ms Rousseff this year, said on September 1st he would not send the budget back to her, as many opposition people want. “It is up to Congress to improve it,” he accepted. And on any fair assessment, Congress shares a lot of blame for Brazil’s economic woes; for example, it neutered many of Mr Levy’s better ideas. Is there any way out? It looks unlikely that tax rises can be avoided: about 90% of the budget is ring-fenced, leaving little discretion for spending cuts. If the government were strong and confident, it might acknowledge the need for a short-term rise in debt while seeking ways to limit spending on pensions, health and education, and laying out a long-term plan to restore fiscal health. But pushing such reforms through Congress would take political will and capital, and this was not done during Brazil’s boom years when it would have been easier. Now, says Mr Almeida, “We are paying for all of the mistakes [of] the past five years.” The mystery, he adds, is why Brazil has not lost its investment grade already. I suppose I can understand a certain level of disenchantment with Brazil but I think your brush is a bit too broad painting all Brazilians as ignorant and corrupt. Nor are Brazilians seeking en masse what Bush called “anchor babies”. You might consider tempering your comments and give them at least as much balance at The Economist articles you repost here. The Economist is quite good and perhaps could be best understood without the one-sided editorial comment. Your friend, if she is Braziiian, sending clothes, or was it cloth, should probably know what to expect from Brazilian customs depending on the NCM classification and the rules for the import of small shipments via the mail or express services. I’m just telling you what my circle of friends from Harvard and Stanford MBA are saying, friends on trading desks and investment banks. So, the Government of Brazil wants to slap a 1500 reais import tax on a used shirt — my friend says, well Dilma and the Government of Brazil need the shirt more than I do, and laugh it off, but it’s not a joke anymore. 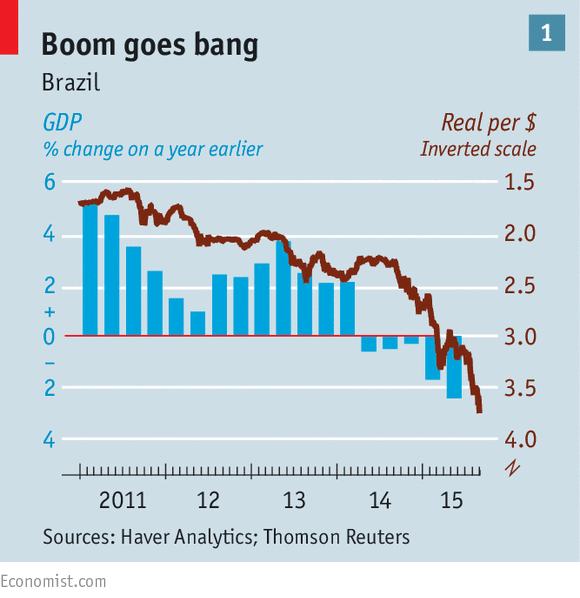 Brazil had a opportunity to get its financial system squared away, but it blew it. Now it has negative GDP growth rates with what, 14% interest rates? And it is not me talking about rich Brazilians getting their education in Europe or going to America to have a child, it is Brazilian friends from MBA programs who are telling me this is happening in their families. It is bankers at Brazilian BNDES who are telling me that they are putting their personal money into property in Florida or into Bank of America — think about that a second, a banker at BNDES, the Brazilian state development bank, putting his money into Bank of America, for safety. Well, in the world of finance, leaving aside the example of a $1500 reais tax for a shirt, the loss of investment grade for the national debt and for Petrobras is as they say in the law, res ipsa loquitur. I would suggest that my Brazilian friends touch up on their options — but from my last conversation with a broker in Brazil, there are only call options available on Vale and Petrobras, again, pointing out how Brazilian finance is in prehistory. The Economist article is really not balanced. “Standard & Poor’s to demote Brazil’s debt to junk status” and “Petrobras, the state-controlled energy firm which is also at the centre of Brazil’s biggest-ever corruption scandal, earned another dubious distinction as the world’s largest company without an investment-grade credit rating” are the financial equivalent of a doctor’s diagnosis of terminal cancer. Your anecdote about your friend trying to ship himself some clothing is the epitome of the way Brazilian government and its expensive and vain bureaucracy treat Brazilian citizens: like servants and walking wallets. In part because of such attitudes, we are starting to see a phenomenon that has already happened in Brazil during the 1980s: brain drain. The bright, the well educated, the entrepreneurs, those with the highest content of human (and financial) capital have all started to leave the country. They are tired of being robbed blind, tired of being mistreated, tired of all the mess. The difference is that lot of people who left in the 1980s came back in the mid-1990s with FHC and the Real Plan. I don’t think the country will be so lucky this time.